Last week, the Unicode Consortium, the body that makes sure that digital text is compatible across different systems, announced more than 150 new additions to the emoji canon. There’s a bagel, a lobster, and even red hair. There is also, finally, a skateboard, joining other arguably more niche events like snowboarding, fencing, and water polo. 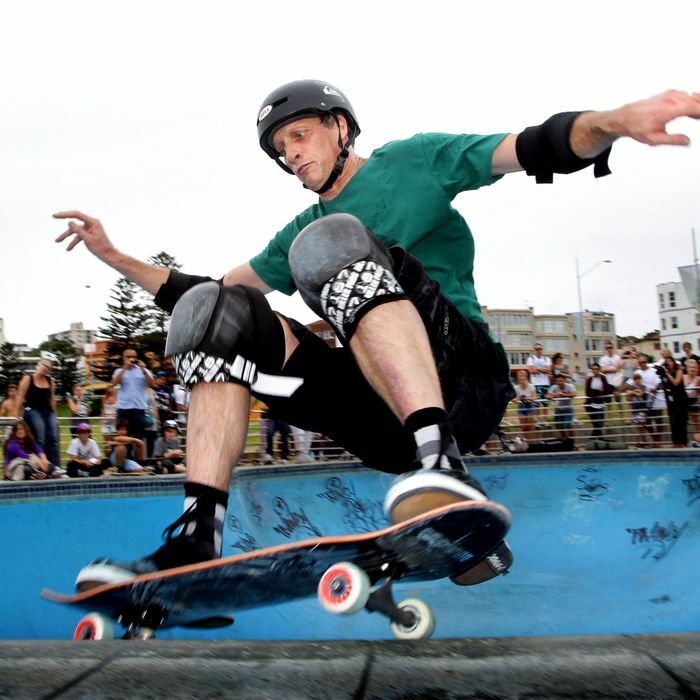 For Tony Hawk, the announcement of the skateboard was bittersweet. The inclusion of the sport was nice, but the preliminary art that the consortium had come up with was … lacking. Now, the Hawkman is working with the folks at Unicode to help fix the pictograph before it makes its official debut. He took some time earlier today to recap his emoji saga to Select All. When you first saw the proposed design, what was your reaction? Just disappointed that they weren’t either keeping it up-to-date or had much knowledge of skateboards. It basically looks like a skateboard you would buy at a department store in the ’80s. What about it is dated? Firstly, the shape, and the top of it. The way the grip tape is cut, it’s called a die cut — doing grip tape, then leaving a big blank spot in the middle. It just is very much a mid-’80s skateboard, but at a beginner level, and definitely not representative of modern skateboarding. And I get that some emoji are kitschy and maybe retro, but this one … we don’t have a skateboard emoji and a lot of people in the skate community have felt slighted by that. For them to bring this one in, it felt like they weren’t doing the research or were making fun of it. Had you been waiting for a skateboard emoji for a while? I’d like to say that I haven’t because I’m not a massive emoji user, but at the same time, when I started seeing other activities get recognized, then I started to wonder why we never had one. I’ve been waiting for one since I’ve seen them getting updated, especially including snowboarding. I realized that we were long overdue — skateboarding’s been around longer than snowboarding. The Unicode Consortium reached out to you to fix this. What’s that been like? I noticed one of the comments on it on Twitter was from this guy Jeremy Burge, who is actually part of Emojipedia and [the Unicode Consortium]. It was like, you should submit this through the right channels, and if it gets enough support, then that could happen. Fast-forward to a couple weeks ago: They announced the new emoji and skateboarding was included in it. I found what they had proposed and I put it out on my social media just saying, “Welp, here it is; we finally got one, even though it’s not necessarily what we hoped for.” And he immediately commented — he was like the second comment — he was like, “You can help us fix this,” and then reached out to me privately, and we’ve been going back and forth with a few ideas. What sort of ideas are you guys throwing around? My suggestion was to have it be an actual character on the skateboard, and he told me that in order to have an actual skater on it, then you have to do it male and female and all the different skin colors. It was more unlikely that they would approve something like that because of the amount of emoji that they would have to add. It’s much easier to just have the skateboard itself. What would your ideal skateboard emoji look like? Something a little more modern, more of a Popsicle-shaped skateboard with solid grip tape. Maybe something to spice it up, like colored wheels, or if you were able to see any graphics. Something artistic, but no brand, obviously. Something that gives an artistic impression without leaning toward a certain brand. Do you have any favorite emoji? I think the David Bowie one was the one I was most excited about when they released the last round. That kind of inspired me to reach out because I was thinking, like, If they’re going all the way and doing a David Bowie tribute, I don’t see why skating is that far off. In this round they announced something like 150 emoji. Do you think there are too many emoji? I’m in my 40s, so I don’t know how to scroll through them anyway. I usually have to employ my daughter to help find what I’m looking for. I’m already lost in a sea of emoji, and it doesn’t bother me anymore because I’m not going to be able to find all of them anyway. I’m amazed how far emoji have come, and have become sort of an international language unto themselves. That phenomenon seemed like such a novelty at first, and now it’s just another normal way to communicate.